Welcome to the Jupiter Symphony Chamber Players Web Site. 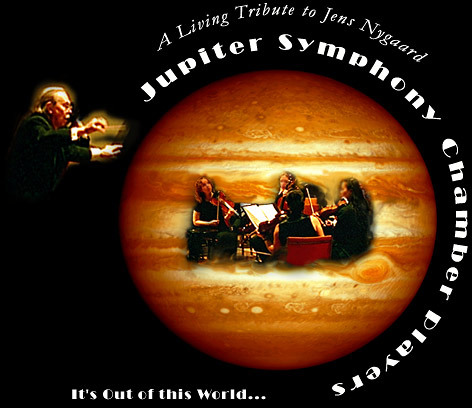 A chamber music series to acknowledge and perpetuate the legacy of conductor Jens Nygaard, continuing a marvelous journey through the universe of music that includes works from the standard repertoire and the rarely-performed, and featuring outstanding musicians. This page requires a frame capable browser to view. Visit our non-frames pages. We would like to thank our patrons, supporters and Friends for their generous contributions, which have enabled Jupiter to give numerous performance opportunities to very talented musicians. Grateful thanks also to Dr. Harmar & Leslie Brereton, Jeffrey Duban & Jayne Connell, Rita Greenstein, Arlene Hajinlian, Stanley Moldovan, and Tim Shepard for accommodating many of our rehearsals; and many thanks as well to our volunteers for their help on concert days—Anna Early, Mark Longaker, Lillian Redl, Peter Roncetti, Madelon Spier and Noel Werrett. Not least of all, we are deeply grateful to our Jupiter fans from near and afar for contributing most generously to our Piano Fund. Within 3 months, we reached our goal of $50,000—the cost of the piano, the move, and the initial work to make it playable. Thank you so very much! A modest surplus has enabled us to replace the worn-out bench and, most importantly, to work on enhancing the piano’s lovely sound, which our wonderful technician Kaz Tsujio continues to do. It is a work in progress! The need for Jupiter’s own piano arose when Jens Nygaard’s arrangement with Yamaha Artist Services to offer its CFIIIS gratis for Jupiter’s use came to an end in August 2012. After a search, much deliberation, and surmounting obstacles, we opted for the purchase of a Steinway concert grand for a price that’s “not bad.” It was evaluated as a piano with a singing quality and a soul. We hope you and our musicians like it. Jupiter is grateful to Yamaha Artists Services for the use of the company’s flagship concert grand piano CFIIIS for more than a decade. We will always remember our piano technician Thomas A. Sheehan, who died in May 2005, for his efforts to obtain the CFIIIS from Frank & Camille’s. Jupiter concerts are made possible, in part, by public funds from the New York City Department of Cultural Affairs in partnership with the City Council, and the New York State Council on the Arts with the support of Governor Andrew Cuomo and the New York State Legislature. Copyright © 1999-2016 Jupiter Symphony. All rights reserved.